The stories of yesterday’s women adventurers are often lost in time — let’s get them ‘back on the map’ as role models for women in the 21st century — Women of the World like Lady Hester Stanhope, the first Western woman to cross the Syrian Desert; writer and explorer Mary Kingsley; and of course, crusading journalist Nellie Bly who beat Phileas Fogg’s fictional Around the World in 80 Days record 125 years ago. Today’s women adventurers are not only rowing around Britain (Belinda Kirk), skiing alone across Antarctica (Felicity Aston MBE), and reaching the North and South Poles (Ann Daniels), but also following the footsteps of their predecessors like Isabella Bird, Mary Kingsley and Isabel Godin (Jacki Hill-Murphy), to name but a few. Female explorers are true Women of the World. 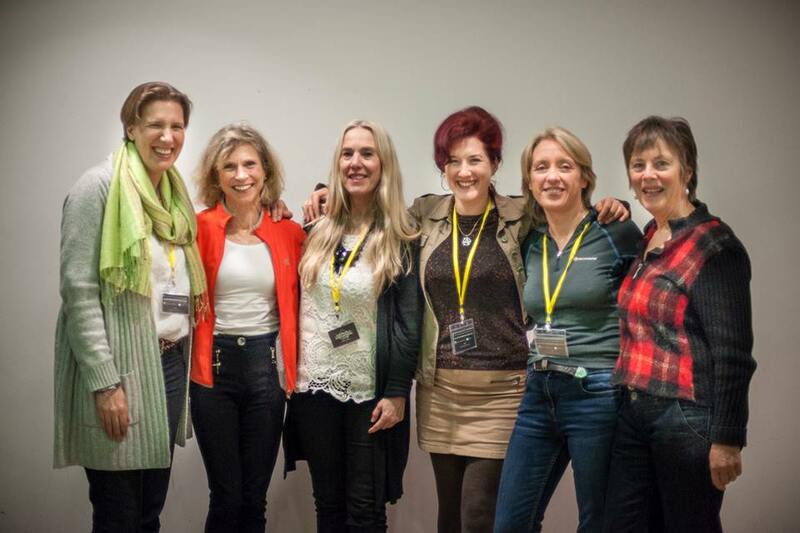 Join me for a 15 minute WOW Bite on women explorers Sunday 13 March at 11.30 a.m. at the Women of the World Festival. 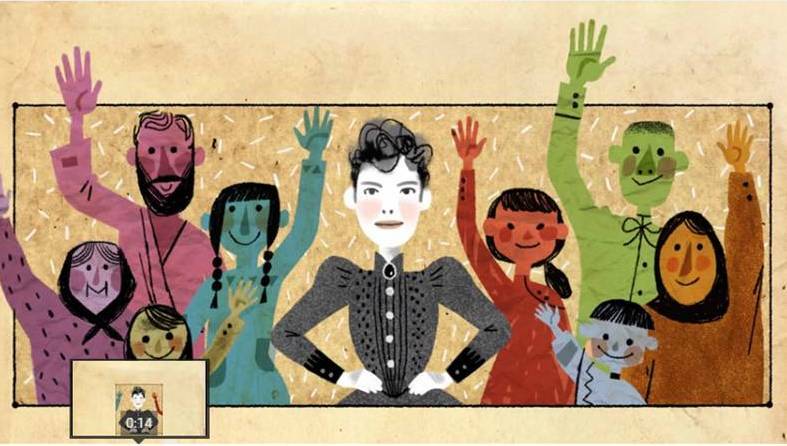 Nellie Bly’s 151st birthday was celebrated with a Google doodle that raced around the world. Katie Wu created the animation for Google based on an original song composed and performed by Karen O.
Nellie Bly beat her own world record on 5 May 2015 when she ‘raced’ around the world in 24 hours. In 1890 Nellie set the record for circling the globe – 72 days by ship and train. 125 years later she sped through cyberspace, adorning the Google homepage as a Google Doodle across continents and countries including the USA, France, Africa, India and Australia. It was Google’s way of paying tribute to the intrepid journalist/adventurer/humanitarian on the occasion of her 151st birthday. Watch it here. 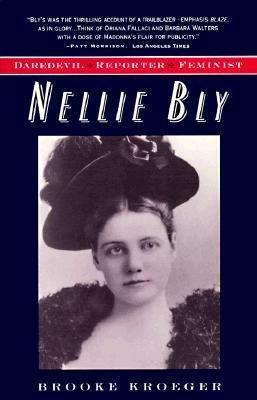 Nellie was trending all day on twitter in the USA on 5 May, according to Brooke Kroeger, Nellie Bly biographer. An estimated 3.5 billion internet users were exposed to the achievements of the famous reporter through the Google Doodle. 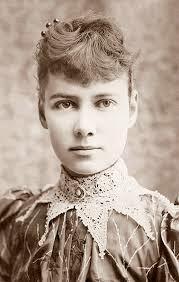 Nellie Bly ‘spoke up for those told to shut up’. Animation by Katie Wu for Google. The doodle applauds Nellie’s iconic global voyage and honours her as a reporter who pioneered investigative journalism and burst into male-dominated newsrooms. Nellie’s 151st birthday google doodle is reported as showcasing two firsts. “Oh Nellie” was the first original song commissioned for a google doodle and Katy Wu’s ‘cartoon’ was the first to feature stop-motion animation. 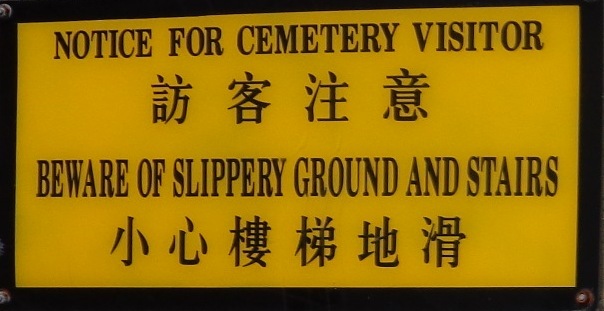 All images used here are courtesy of Google. 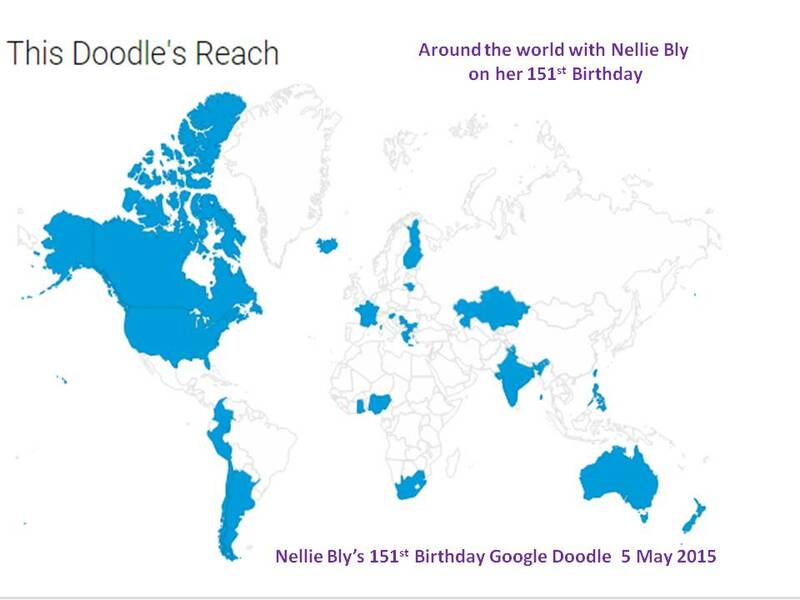 Nellie travelled around the world through cyberspace thanks to Google. Here’s her route. 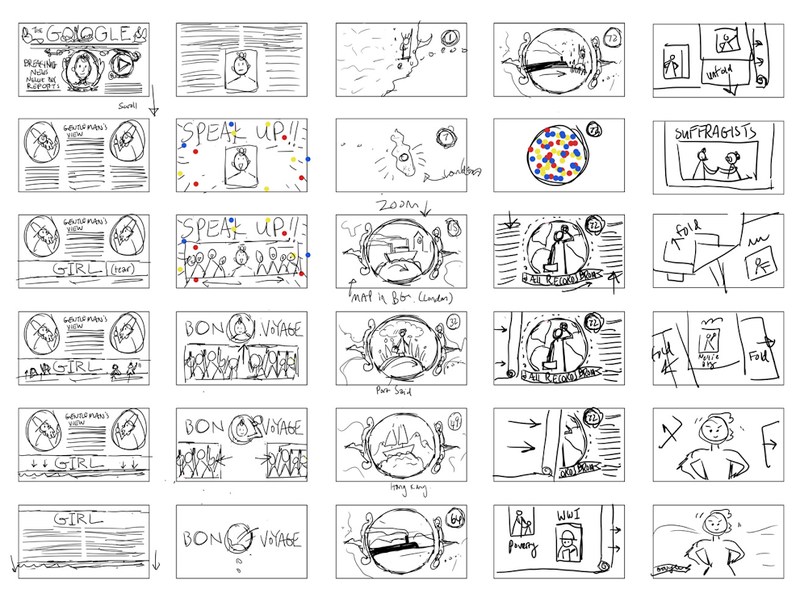 Nellie Bly Google Doodle storyboard by Katie Wu. 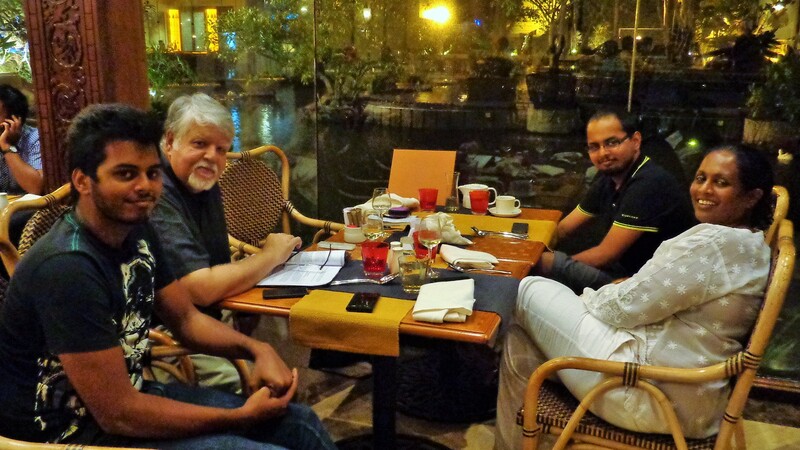 It’s the best of journalism meets The Amazing Race meets Around the World in Eighty Days. 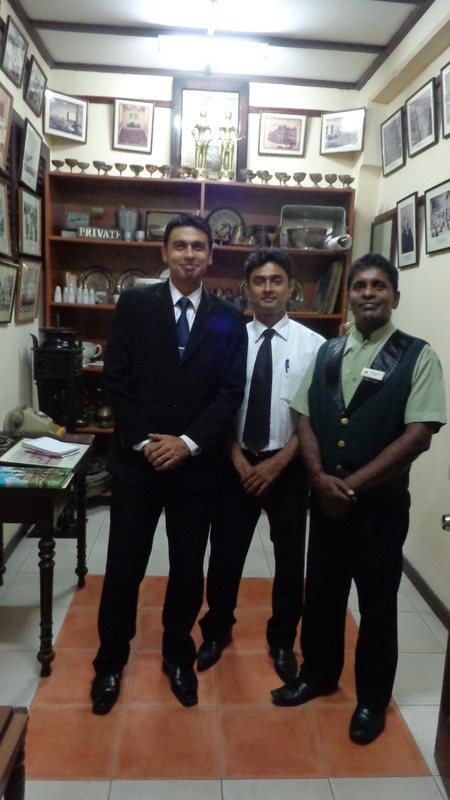 Phileas Fogg, move aside. One of the most daring stories in history is that of investigative journalist Elizabeth Jane Cochrane (aka Nellie Bly) who in 1889 decided she would try to beat the fictional record in Jules Verne’s now classic story and go around the world less than 80 days. At the same time, because competition is the name of the game in journalism, Cosmopolitan sent their own reporter Elizabeth Bisland, out to beat not only the 80-day fictional Phileas Fogg record but also try to one-up Bly who was working for Joseph Pulitzer’s New York World newspaper. 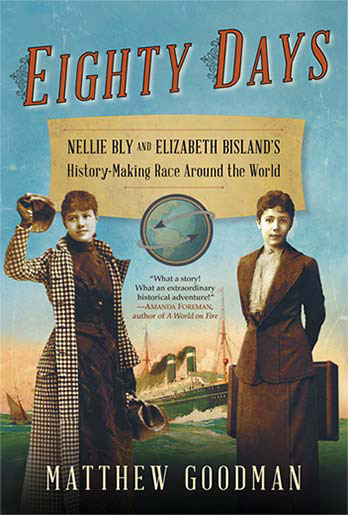 Now that story, based on Matthew Goodman’s bestselling book, “Eighty Days: Nellie Bly and Elizabeth Bisland’s History-Making Race Around the World” is being developed for television by Zero Gravity Management’s Christine Holder and Mark Holder with producer Lloyd Levin (Boogie Nights, United 93, Watchmen) and Beatriz Levin. The race started on November 14, 1889 and each reporter left from New York, but went the opposite way around the world. The story grabbed headlines at the time and enthralled readers who were kept on the edge of the seats as each reporter filed stories about their dramatic and sometimes dangerous adventures. 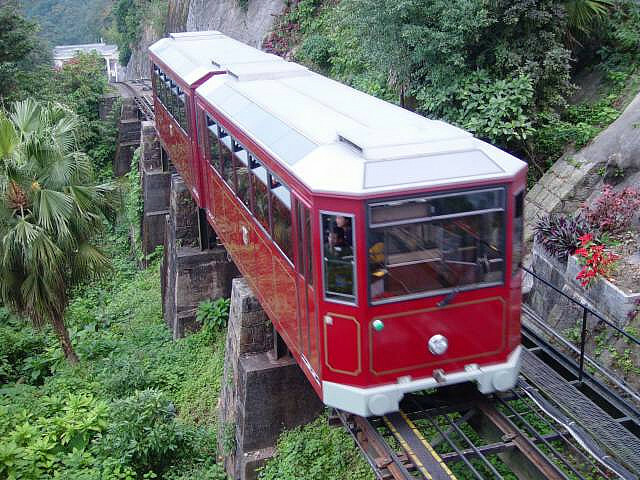 The race spanned over 24,000 miles using railroads and steamships as their main mode of transportation. Beyond captivating the nation, the lives of both the well-respected journalist Bly and her competitor Bisland were forever changed by the journey. Bly ended up winning the race by four and a half days and set a world record. 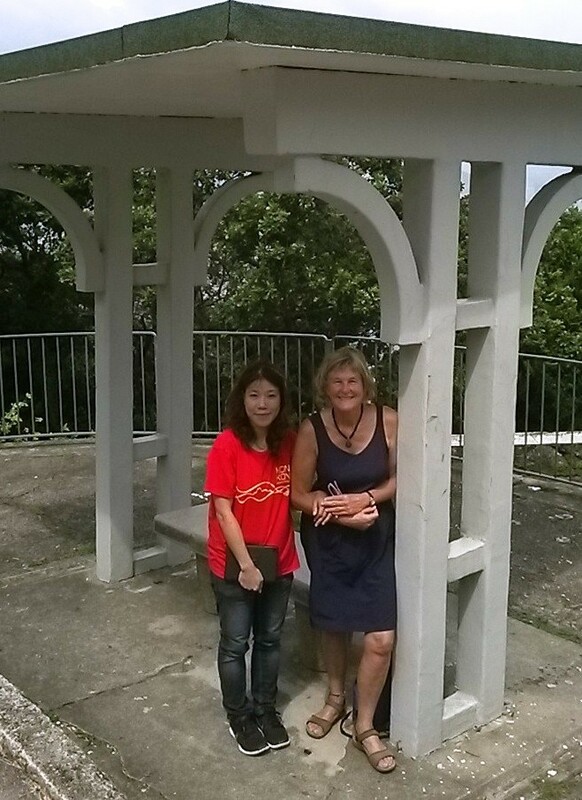 She had circumnavigated the globe in 72 days. Nellie Bly is top of the lists. Nellie Bly is ‘back on the front page’ as a chart-topper in the historical, convention-busting, inspiring and feminist leagues. Here’s the full list of 10 Books about Inspirational Women You Should Know More About. Online worldwide news site Buzzfeed named Nellie Bly as one of the Top 12 Historical Women Who Didn’t Give a ‘you know what’. “Nellie Bly was a daring and influential investigative journalist who wrote groundbreaking stories about political corruption and poverty. She once faked madness in order to report undercover from an abusive mental institution in New York City, which led to outcry and reform. Her jealous peers referred to her investigations as “stunt reporting”, but Nellie, of course, didn’t give a x*!x*! about those whiny little x*!x*! Oh, and she once travelled around the world in a record-breaking 72 days, just ‘cause. Here’s the post. Nellie exposed the abuses taking place inside the Women’s Asylum. Following that blockbuster story, Bly circled the world in 72 days in imitation of Jules Verne’s book, married a millionaire, ran his steel manufacturing company after he died, and developed a number of patents for her business. She covered the suffragist movement in an article titled “Suffragists Are Men’s Superiors” in 1913 but correctly predicted women wouldn’t get the vote until 1920. The Pittsburgh Post-Gazette where Nellie was once a reporter invites us to ‘Learn from the Past’ via Nellie Bly. 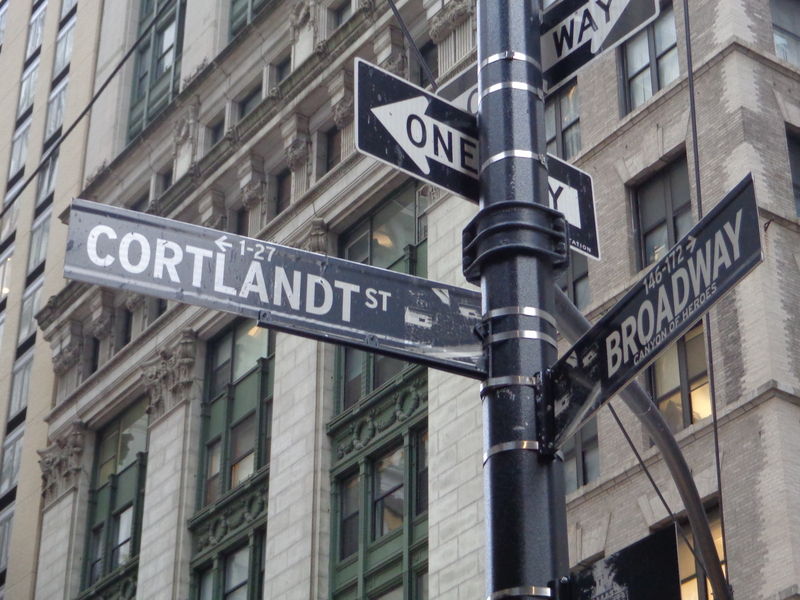 “In 1887, she moved to New York City and landed a job at the New York World. For one of her first assignments, she went undercover as a patient at the Blackwell’s Island Insane Asylum. 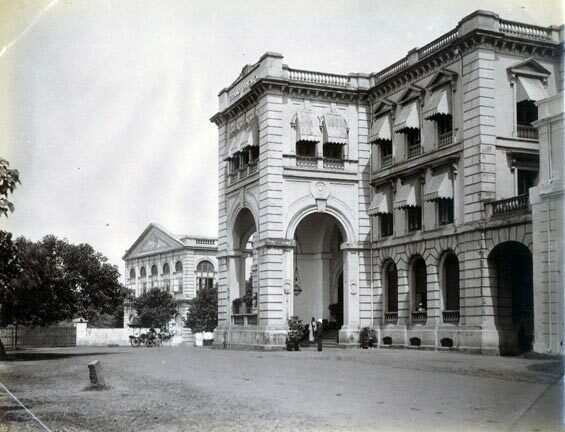 She spent 10 days experiencing the asylum’s deplorable living conditions, which included rotten food and physical abuse from the staff. 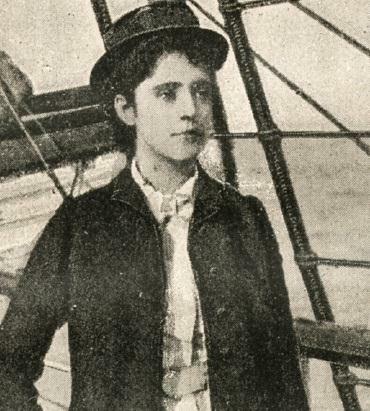 After the New York World demanded her release, Bly’s firsthand accounts of the horrors of the asylum, “Ten Days in a Mad House,” became a book that prompted a grand jury investigation.Two years later, she decided to travel the world faster than novelist Jules Verne’s character Phileas Fogg in “Around the World in Eighty Days.” She boarded a ship from New York Nov. 14, 1889, and returned Jan. 25, 1890 — 72 days, six hours, 11 minutes and 14 seconds after her departure. Read the full article here. Nellie took the train to Hoboken Terminal to board the Augusta Victoria. “On Thursday November 14, 1889 at 9.40.30 o’clock, I started on my tour around the world,” wrote Nellie Bly in Chapter 2, entitled The Start, in her book Around the World in 72 Days. 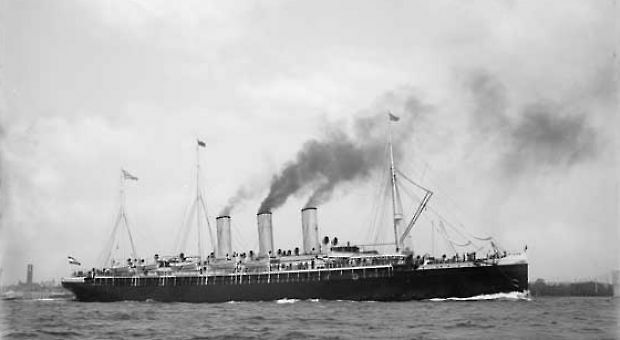 Nellie crossed the Atlantic on the Augusta Victoria. “The morning was beautiful and the bay never looked lovelier,” she recalls of her departure from Hoboken, New Jersey in New York Harbour. “But when the whistle blew and they were on the pier and I was on the Augusta Victoria, which was slowly but surely moving away from everything I knew, taking me to strange lands and strange people, I felt lost,” she wrote. Nellie had never ever been on a sea voyage before. The President and First Lady’s departure from the United Nations on Air Force One. 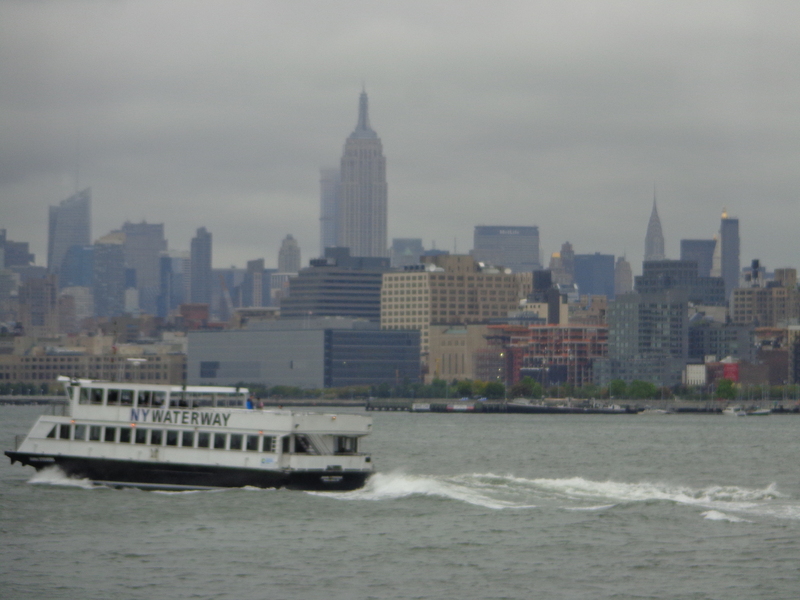 The morning was grey with sudden squalls when we headed to Pier 11 near Wall Street for the ferry to Hoboken to retrace Nellie’s departure. 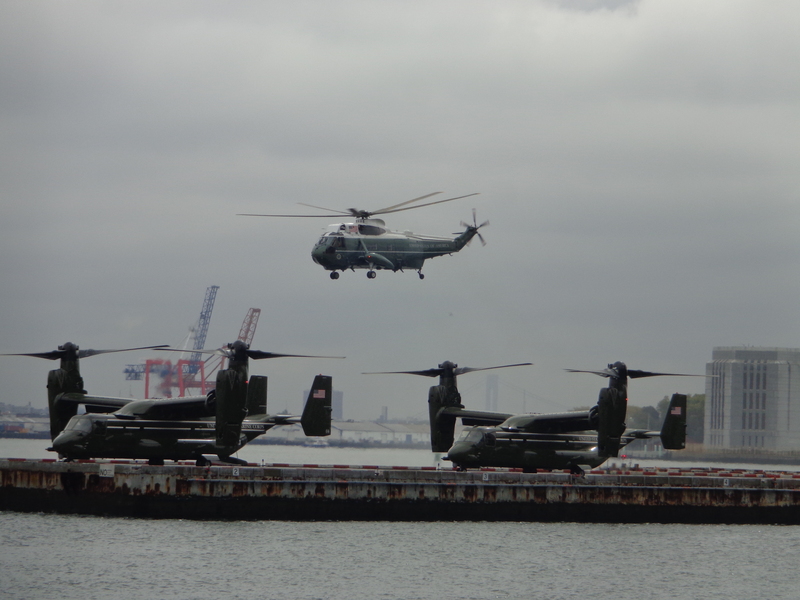 Two ominous Osprey aircraft suddenly came swooping onto the Downtown Manhattan Heliport nearby. 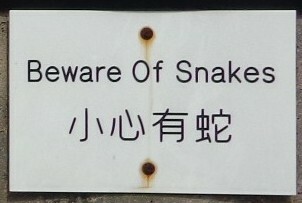 They were followed by a drove of helicopters and police cars with flashing lights. 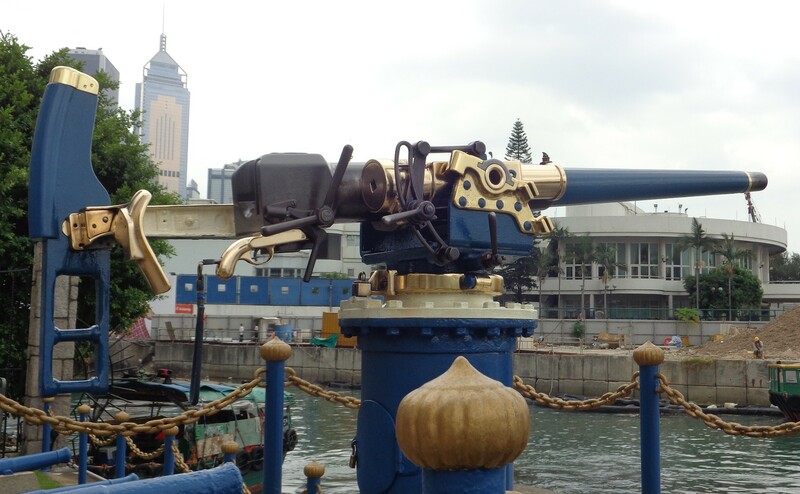 A Coast Guard cutter plied the waters. We looked up to see snipers atop the roofs of nearby buildings. President Obama and the First Lady were leaving town by Air Force One after three days at the United Nations of discussions on climate change, foreign terrorist fighters, education for all, and the Ebola epidemic. Soon the harbour was shut and ferries were frozen. Flocks of people in black suits delivered in long black cars strode towards the aircraft so we even never knew if we saw the President and Michelle Obama. Within minutes of lift-off, the scene was cleared, the ferries were back in business and the Obamas were on their way to the White House. 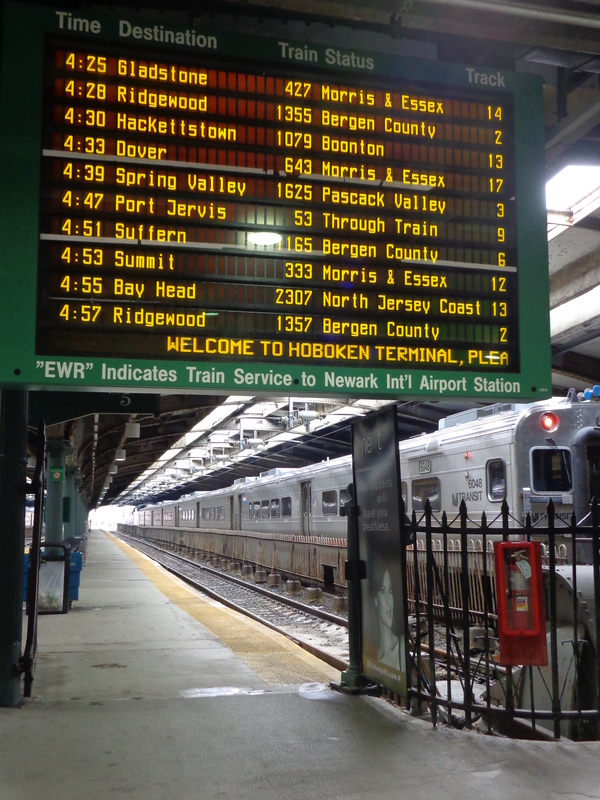 And we were on the way to Hoboken where Nellie started, and then Jersey City where she finished her epic travels. Nellie’s train pulled in to Jersey City at 3.51 p.m. on 25 January 1890, 72 days, 6 hours,11 minutes and 14 seconds since she had left. No one had ever gone around the globe as fast. By then she was the most famous woman in the world. After traversing 18 waters from New York Harbour to San Francisco Bay , she was at the end of her ‘flying trip’ by train across America. 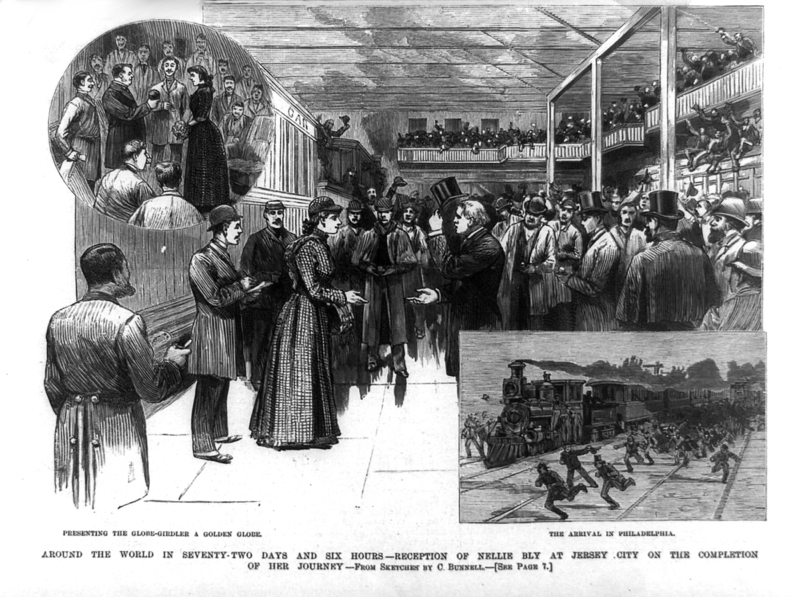 Nellie arrived to a packed Jersey City station on 25 January 1890. 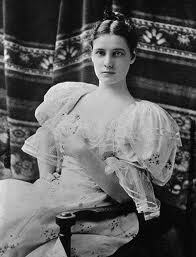 People dressed in their Sunday best flocked to the train stations along her route to cheer on Nellie Bly. Multitudes of well-wishers filled the stations as she travelled through Albuquerque, Columbus, Pittsburgh, Philadelphia. At Pittsburgh’s Union Station, not far from her hometown of Apollo, thousands turned out at 3.10 in the morning to wave her on. 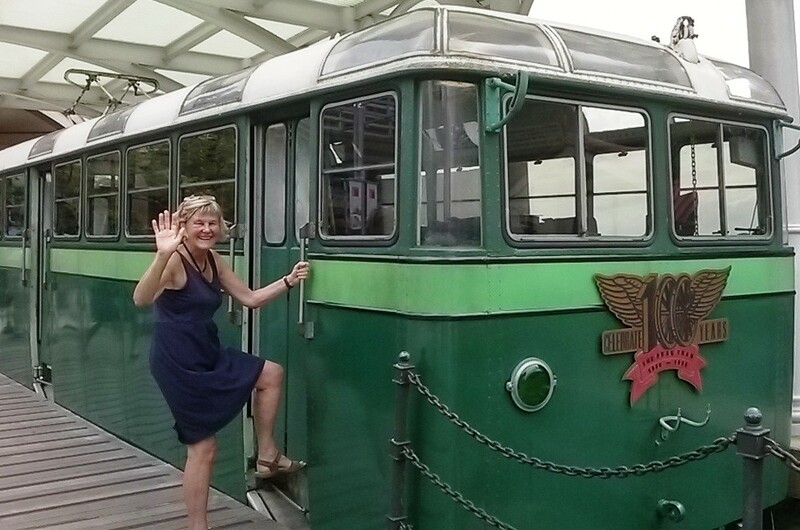 Nellie stepped onto the rear platform of her car and waved with tears in her eyes to all those who came in the middle of the night to see her. 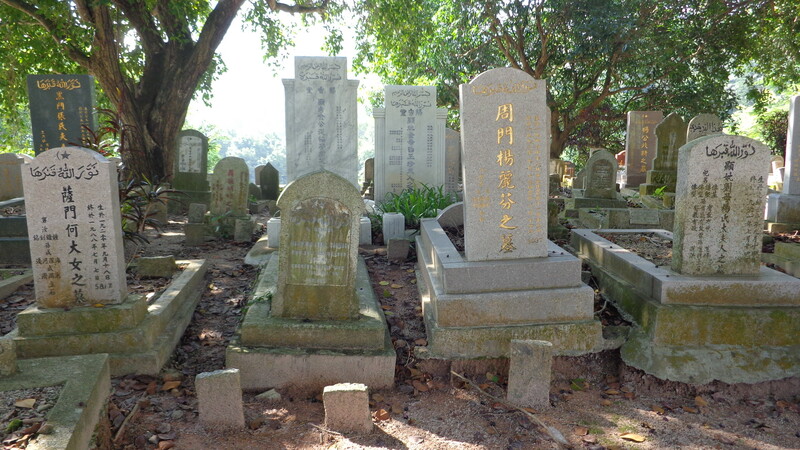 When she reached on the afternoon of January 25th, 1890, she had won the race. The station was overflowing. On her victory parade to the New York World‘s headquarters at Park Row, the streets were choked with people and the windows of skyscrapers lining Broadway were filled with faces as Nellie’s carriage made its way.